← Remember to Save Two Minutes Today for Adventure! I think they came out pretty cute! It took me a while to get the head where I wanted it to, but I think it was well worth the frogging and the wait! If you changed up the ears and shortened the body, you could have a little fox plush! 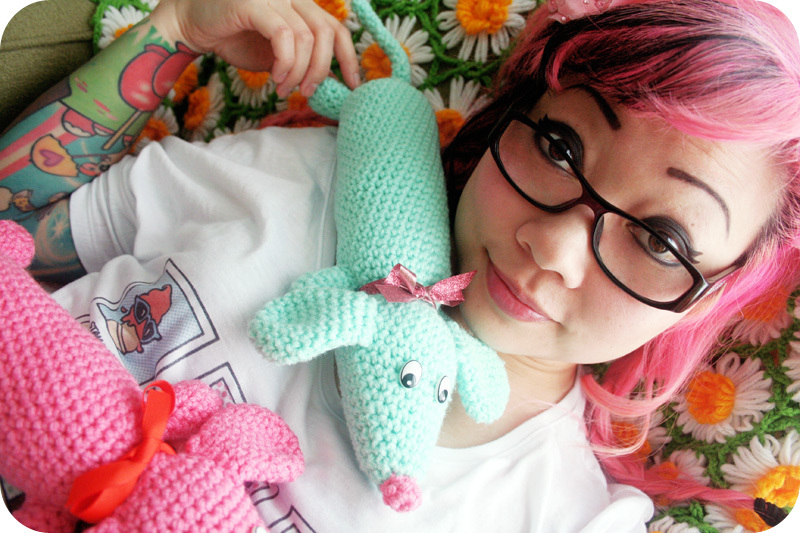 If you changed up the ears again and shortened the body, you could have a little mouse plush! Or if you made the body really super duper long, you’ll have one of those draft-stopper door thingies! 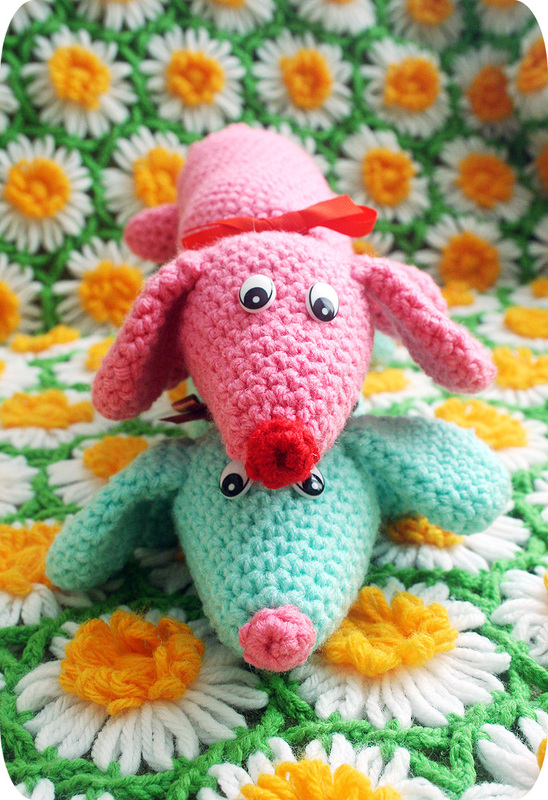 Please note, I didn’t decide to use safety eyes until after I finished crocheting the doggies, so the eyes are glued to the surface and are not true safety eyes. 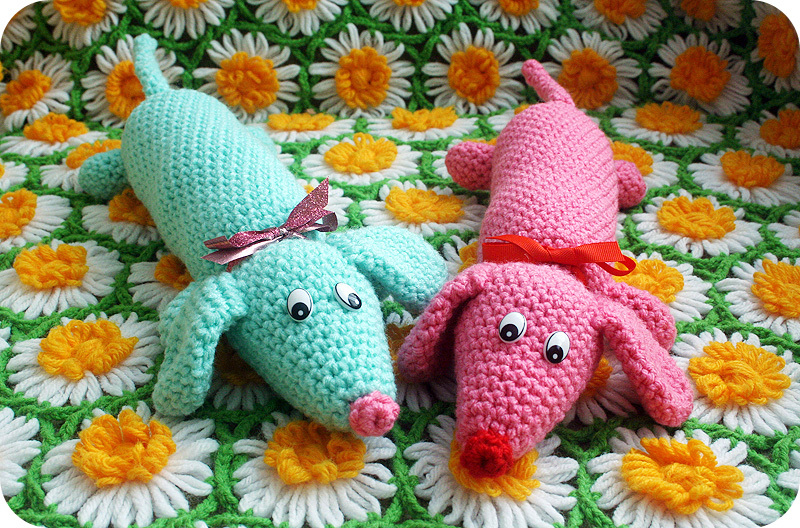 Also please note that since there are small parts involved, these doggies are not meant for small children who like to eat random things like plastic eyeballs. For size reference, see pictures of me with the doggies below. 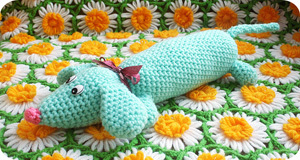 Mint Weiner Dog Plush – $35.00 + shipping (100% acrylic)- I think his name is Hank Frankenfurter. 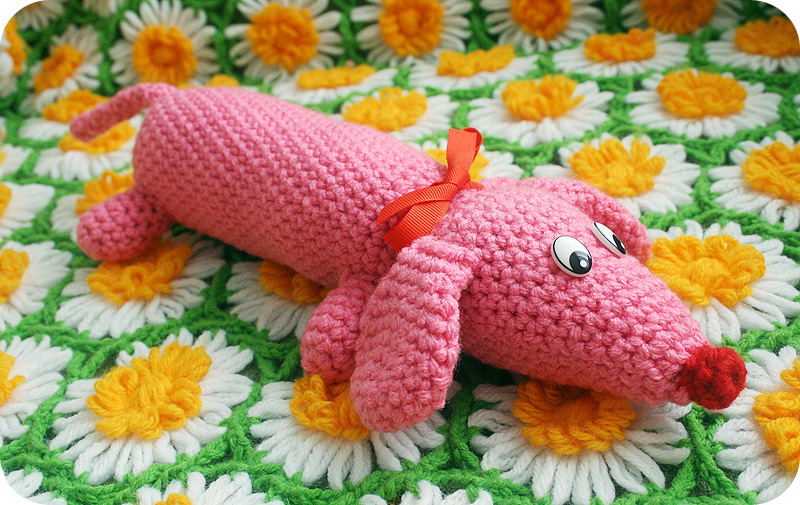 Pink Weiner Dog Plush – $35.00 + shipping (100% acrylic)- I think her name is Fiona Frankenfurter. Thanks so much for helping me support Pistol and Tiffany! OH MY GOSH. IF you have a pic of the twins, I would love to see! 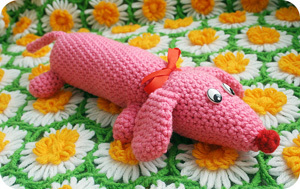 I love this pattern 🙂 Just got it and will make one in honor of Muttley…..
Aw Muttley!! Thanks so much, Yvonne! Oh my so adorable! Your talent never ceases to amaze me! Adorable! My pup Loki is a weenie dog. 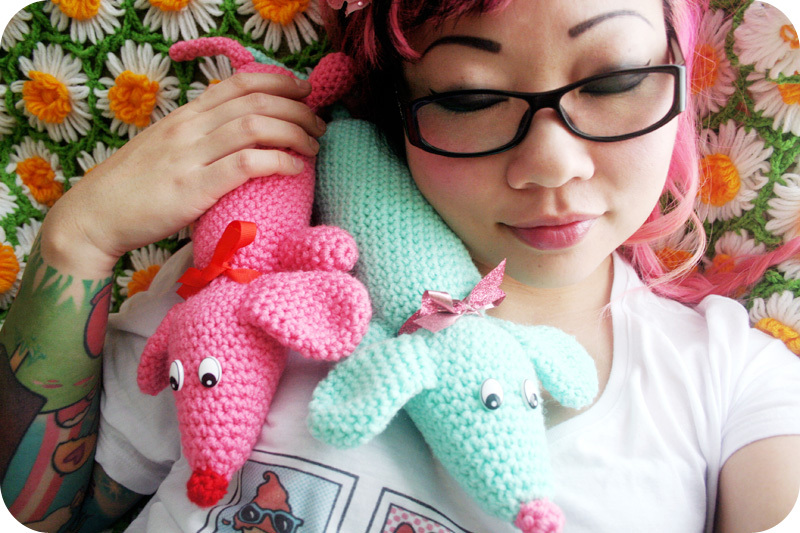 He would dig the pink one, because for some reason that’s his favorite color. 🙂 You are awesome helping out your friend and her pup! 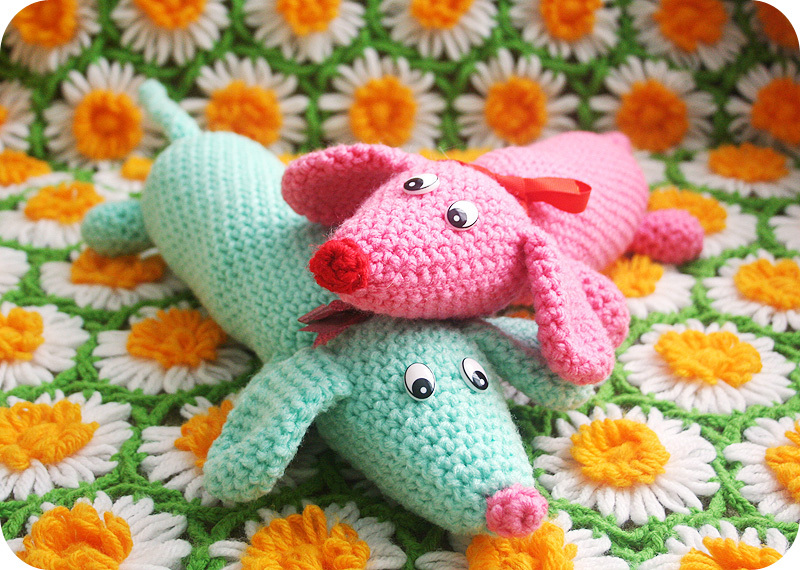 did you make the flower mat for the dogs? Hi! No, it is vintage, from Etsy.